This is a spot about 8km from home. The massive pine tree has caught my eye before but not when I've had time to stop and paint. Lots of greens always means lots of "fun". It's a real challenge to differentiate all the tones and temperatures when you're standing before a scene like this. I started around 2pm with the sun sitting high in a clear blue sky, so almost everything was in the sunlight. But things were ever-so-slightly back-lit and it's obvious the vines are darker than the grass and, with enough staring and squinting, they start to look warmer too. So the green for the paddocks and the grass between the vines gets more blue mixed into it. 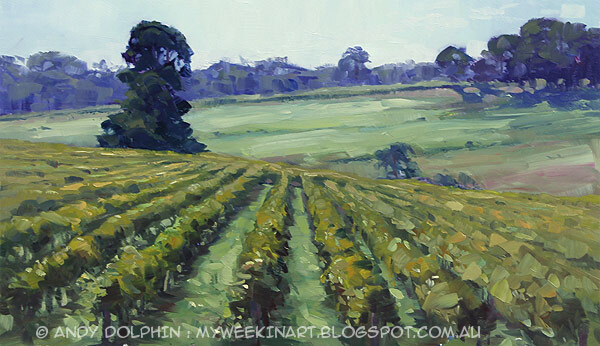 To push the warm-cool contrast still further, the vines get more yellow and even a little red mixed into their green. Although I am not a painter, I think that the disjunctive perturbation of the negative space visually and conceptually activates the accessibility of the work. 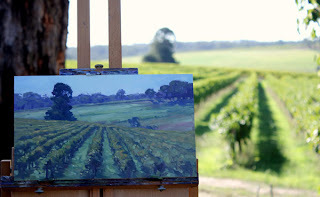 I painted the horizon and the far edge of the vineyard level. But it was very windy and the easel was swaying. Plein air painting is tough! Blown out? I told you it was windy - it was probably blown away! I think you did a fantastic job!